Research suggests that more than 40 percent of the actions we take each day are habitual (1). That means that almost that half the time you’re doing something, it’s not because you decided to do it. You’re doing it simply because you’ve done it so many times in the past that the behavior has become automatic. The best way to easily improve your life is to learn how to change these habits. Because when you do that, you can make them work for you every day. And you won’t even have to think about them. A good habit moves you closer to your goals. A bad habit does the opposite. When you know how to change your habits effectively, you can create more good habits and eliminate more bad habits. And then you can consistently move closer to your goals by default every single day. How neat is that? Let’s look at how habits work. The cue. This is the trigger that starts your habit. Example: You get an email notification. The routine. The habit that follows the cue. 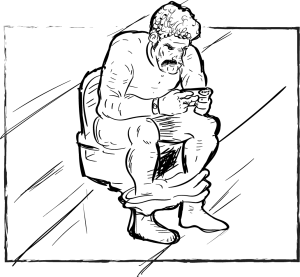 Example: You open the email. The reward. The benefit you gain from doing the habit. Example: You get to know what the email is about. If you perceive the reward as positive, you’ll want to repeat the loop again the next time the cue shows up. Repeat this sequence enough times and you’ll create a habit. Thinking about your habits in this framework is very helpful because it helps you see what initiates the behavior, what the behavior is, and the reward you get from it. This is very powerful because by breaking your habits down into these parts, you can start manipulating them to get them to work for you. You’ve probably noticed that habits are hard to break. It’s a much more effective approach to replace them. For example, if you smoke when you get stressed, it’s usually a pretty bad idea to just stop smoking. Instead, you should come up with a different way to deal with the stress and insert that behavior into the loop. Your cue and reward stay the same. All you change is the routine. Obviously, quitting smoking isn’t as easy as just going for a walk. But if you experiment with different substitution habits (while using other aids at the same time) you’ll increase your chances of success. There are plenty of ways you can make positive changes in your behavior by using substitution habits. And they don’t have to be huge to have a significant, positive impact on your life. If you spend 15 minutes on the toilet every day reading on your phone, that translates into 90+ hours every year. How much could you learn in that amount of time if you watched videos from Big Think, ASAP Science or The School of Life every time you ‘throned’? Or read excellent blogs or book summaries about your area of expertise? Waking up — Instead of falling back to sleep, use your snoozing time to think about three things you’re grateful for. Relaxing — Instead of watching TV shows, read a great book. Standing in line / Stuck in traffic — Instead of restlessly waiting, use this time to practice some mindfulness. Walking / Running — Instead of just moving from point A to point B, listen to an educational podcast. Housekeeping — Combine doing the laundry, dishwashing, and cleaning with an audiobook. Taking a break — Instead of reading celebrity gossip, relax your mind with five minutes of meditation. Snacking — Throw away your unhealthy snacks and prepare healthy alternatives. Walk in the door rule — No matter what your day has been like, always talk about the best thing that happened first (4). Going up — Always choose the stairs rather than the elevator. Getting into to bed at night — Turn off your phone and write in your journal. By themselves, small changes like these won’t make much of difference. But if you systematically start adding one after another, together they can create massive change. That’s because substitution habits are simple enough to help you just get started. And when you get started, you start building momentum. And once you’ve got momentum, it’s only a matter of time before your efforts start compounding on themselves and create positive ripple effects across all areas of your life. If you like the idea of substitution habits, I encourage you to try one out right now. The time to take action is when the inspiration is high. Pick ONE substitution habit. If you try making several changes at once, they’ll all likely fail. Don’t overwhelm yourself. Use the list above for inspiration and decide on one change you’re going to make. Create an “implementation intention”. Frame your goal in an IF –> THEN statement. The ‘If’ should represent your cue, and the ‘Then’ is your habit. For example: IF I sit down on the living room couch, THEN I’ll read my book. Pick a reward. Celebrating small successes is a powerful way to reinforce good habits. A tiny reward can get you addicted to your new behavior. An excellent way to do this is to check off your habit in a habit tracker. My favorite is Coach.me. Manipulate your environment. Change the “activation energy” of your habits. Make your substitution habit as easy as possible to do and the old habit as hard possible to do. For example, put a great book right next to your couch and put the TV remote in another room. Rehearse the new habit. By practicing the substitution habit a couple of times, you’ll be much more likely to remember it. You can do this in the environment where the habit will take place, or in your imagination. Schedule a weekly review. Take 15 minutes every week to review the progress in your habit tracker. Did you complete your habit every day? If not, ask yourself what got in the way. Then adjust your approach for the following week. There are no failures, just valuable data. Once you’ve completed these five steps, it’s all about showing up and doing the habit every day. Know that there likely will be some resistance in the beginning, but that it will get easier over time. The best way to easily improve your life is to change your habits. 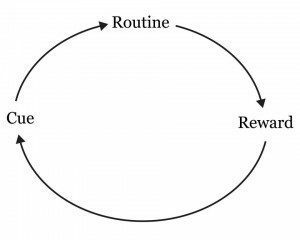 The habit loop consists of three parts: a cue, a routine, and a reward. By breaking your habits down into these parts, you can manipulate them to work for you. You can use substitution habits to replace negative or neutral habits with more empowering ones. Substitution habits help you get started, build momentum, and create positive ripple effects across all areas of your life. To get started, pick ONE habit, create an implementation intention, choose a reward, manipulate your environment, rehearse the new habit, and schedule a weekly review. Make one small empowering change today. When that habit is in place, make a new one. And then another. With time, you’ll start feeling and acting like a completely different person. And before you know, your life has changed for good. Image courtesy of Joel Lindmark (Society6).